Creating endlessly versatile designs for your next adventure, Odlo has created these functional zip-off Wedgemount trousers as part of our popular Off Course collection. A technical blend of urban styling and endurance design, these handy zip knee trousers can be adapted to suit any environment from the streets to the highest peaks. 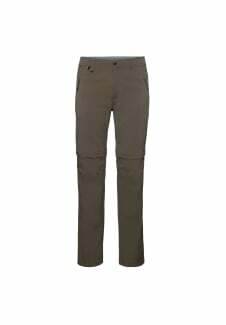 Cut from a stretch nylon weave for improved comfort and flexibility, these all-terrain trousers have been treated with a water-wicking DWR coating and UV 50+ sun protection to offer endless wearability in any setting. Explore the wild outdoors in style with these lightweight and fast drying trousers with clever anatomical zip-leg functionality.